Joakim Noah isn’t quiet much. He’s not Nate Robinson loud. But there’s often some sort of cacophony rising around Noah, as there was almost throughout Saturday’s Bulls opening night exhibition game win in Indianapolis. “Woooooooo,” Noah bellowed as he sat on the bench with his blue blazer over, well, an outfit that traditionally doesn’t blend with a blue blazer. Saturday’s preseason opener, of course, was dedicated to the return of Derrick Rose, the chance, finally, for some empirical evidence that he is or can be the player he was before his serious knee injury. Rose, who reported no after effects Sunday from his first NBA game action in 18 months, was very good, quick, elusive and explosive, and not particularly far from the player we last saw. But in relative terms, perhaps the best player on the floor was Taj Gibson, the enigmatic power forward who led the Bulls with 18 points, 12 rebounds and three blocks, and whose play and presence in the fourth quarter enabled a Bulls lineup with two rookies, Mike Dunleavy and Marquis Teague to hold off a Pacers team still using most of its starters. “I thought the group that finished the game did a good job,” said Bulls coach Tom Thibodeau after Saturday’s game. “Marcus, Tony, Mike Dunleavy, Erik Murphy and Taj. Noah, of course, likes to call Gibson Tajy-woo, and there was plenty for Noah to celebrate Saturday for his buddy. The Bulls fifth year forward looked as good, strong and aggressive as he has in several years, showing a solid jump shot and bold moves and plays at the basket which allowed the Bulls to badly outrebound the bigger Pacers, 56-38 and 17-11 on the offensive boards. And while the return of Rose is considered—and is—the principal reason why the Bulls have a chance to be serious contenders this season, if Gibson can produce on the boards and perimeter even close to the way he did Saturday it could be the X-factor for the Bulls. The Bulls haven’t had a true backup center since losing Omer Asik in free agency before last season. Nazr Mohammed did a good job filling in late last season, and was competitive starting Saturday for the injured Noah. The Bulls have two undersized big men in camp trying to make the team, Dexter Pittman and D.J. White, but their status remains uncertain. So even though just a relatively slim 6-9 and about 230, Gibson stands as the potential backup center, at least certain times. And Noah’s health always is a concern since he’s averaged missing about 18 games per season the last four seasons. But there have been worries about Gibson after perhaps his poorest season with the team last year. Though Gibson’s averages of eight points and 5.3 rebounds were comparable to his career averages–though less than in his rookies season–Gibson seemed to regress after he went to the last seconds before the deadline last October and then agreed to a $33 million contract extension. Whether it was injuries (missing 17 games), trying to live up to his contract, the absence of Rose or just a slump, Gibson frequently was out of sorts. The Bulls had been expecting him to develop. But his shooting was the second poorest of his career, and he’s yet to shoot 50 percent from the field any season in his career despite playing inside. Gibson is one of the more personable and popular players on the team, cooperative with media and always a good sport with his teammates’ taunts and jokes. But Gibson clearly was bearing the weight of the unfulfilled expectations last season. So he went to work. He spent large parts of the summer with Rose in Los Angeles working out, getting stronger, becoming accustomed again to playing with Rose and determined to show the passion and production that had everyone so excited when he was a rookie. “I was in the weight room a lot,” Gibson said. “I got away to clear my mind. I’m letting the game come to me more. Last year was a lot of ups and downs, injuries. It was great in L.A. working with Derrick, and in training camp. So Saturday was a big sign for the Bulls and Gibson. Actually, Gibson was probably the best shooter on the floor for the Bulls. Which isn’t exactly a sentence the Bulls want to be reading much this season. 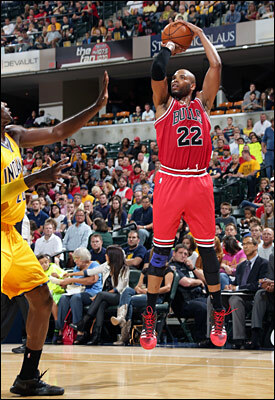 The Bulls made 10 jump shots beyond 15 feet in their 82-76 victory. Gibson made four and had another 12-footer. Last season, it often seemed Gibson’s vision was poor given how awry his shots appeared. But Gibson shot into the 2013-14 season Saturday with a near unerring eye, making nine of 12 shots, including some that left you wondering who was that man. Gibson in the first quarter banked in a five footer left handed that left you wondering if that was Tim Duncan. When Gibson squared up, his shots were true. He blocked a George Hill drive and delivered some trash talk, though it’s difficult for Gibson to be the bad guy and he helped up Hill. Actually, Gibson had by far the biggest plus/minus margin of all Bulls players, that being whether the team gained or lost points when he played. Rose initially left the game with the Bulls leading 17-15. Gibson then had a big late first quarter sequence rebounding and blocking a shot and scoring to push the Bulls farther ahead. And then Gibson carried the reserves down the stretch in the fourth quarter with eight points, four rebounds and two blocks and an overall plus-18. Rose was the only starter to be plus. That, of course, has a lot to do with the return of Rose as Thibodeau is terrific at improvising, and without Rose he had to limit the pace to enable the low scoring Bulls to remain in more games. Now, the Bulls have other methods of scoring. But it will become difficult if they cannot make more jump shots. Obviously, with Rose’s return the attention was on him, and the question to him was whether he had the speed and explosiveness. Though Rose dismissed the need to show anything, it seemed apparent he wanted to demonstrate to the big audience his knee injury had not slowed him. Thus Rose never attempted a three pointer despite his much advertised new shooting range. I suspect we’ll see more of that in Monday’s preseason game in St. Louis against Memphis, which tends to pack in the lane and leave open more shooters. The Bulls only made three three pointers, and two were in the last minutes from deep bench players, Teague and Murphy. The only regular to make a three was Deng. Though Jimmy Butler’s driving and rebounding was impressive, as a shooting guard he’ll have to, well, shoot. Butler ran himself off the three-point line, mostly preferring to drive the ball. He’s an athletic talent the Bulls haven’t had to play along side Rose. But he also has to show he can shoot in order to keep the defenses off Rose and open more driving lanes. Rose was so fast Saturday he made his own lanes. Butler can beat most perimeter defenders off the dribble. But that compromises the team’s court balance. It’s obviously something the Bulls will work on, and, after all, they have played just one exhibition game. But that game in addition to the latest audition with Rose showed that the Bulls may have something else to shout about with the play of Gibson.